Menolly D'Aritgo is cleaning out some of the upper rooms in her bar, Wayfarer, with the help of Iris, when she discovers items that turn out to belong to a bartender who disappeared under strange circumstances. That is just the beginning of her night, and then Menolly and her sisters find a ghoul in on their property that happens to belong to a new neighbor - a necromancer. Menolly and her sisters decide to investigate the disappearance of the bartender, while at the same time, Camille's husbands and their other helpers are trying to figure out just what type of demon is attacking the fae and killing them - before it gets to Delilah again. Hoping this is going to be a simple demon invasion, Menolly and the others discover that the demons, the disappearances and even, in a weird way, Shadow Wing are all combined with a secret society of frat boys. Menolly, Camille, and Delilah need to figure out the common denominator and take care of it in time to carry out their social commitments. After all, girls to just want to have fun. Menolly shows a more light hearted side in Demon Mistress while trying to find out what is attacking fae suddenly and who let the ghouls out. (I know, but I had to). Menolly is finally free to be just herself for the first time since she was changed. In between fighting with new demons, psycho frat boys and keeping Delilah safe, Menolly is finding her sensual side again. Yes, vampires can be sensual and caring. I really loved seeing this new and lighter side of Menolly and hope to see more as the series goes on. 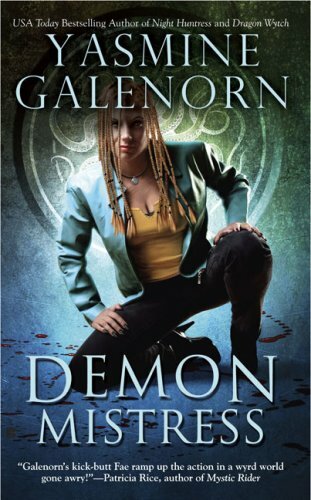 Like the other books in the Otherworld series, Demon Mistress continues the side stories while focusing on one sister - in this case it was Menolly. The laughter, magic and always the love between the sisters and their partners makes Demon Mistress is another winner that will make you hold your breathe in places and want to hug various characters in others. If you have not read the Otherworld series in order, I would suggest doing so. The characters and the world is a complex mix that is added onto with each book. You won't be sorry to begin this series if you like a bit of danger and magic in your stories.